Well, quite a bit actually. David Beckham was recently interviewed on an Australian TV show that is called The Project, where he was discussing his UNICEF contributions and documentaries, and he ended up talking about his oldest son, Brooklyn. David said that his Posh Spice wife, Victoria, is struggling now that Brooklyn has grown up and is starting to date girls. Speaking on camera, David said that it is difficult when your children start relationships, and that he is dreading when his daughter Harper gets older and starts looking at boys. David Beckham also added that he was actually Brooklyn's age when he left home to fulfill his footballing dream in Manchester, which he finds quite bizarre now and a little worrying. Earlier this week, Brooklyn was spotted sneaking out of a trendy London restaurant after dining out with former love interest and best buddy, famous actress Chloe Grace Moretz. 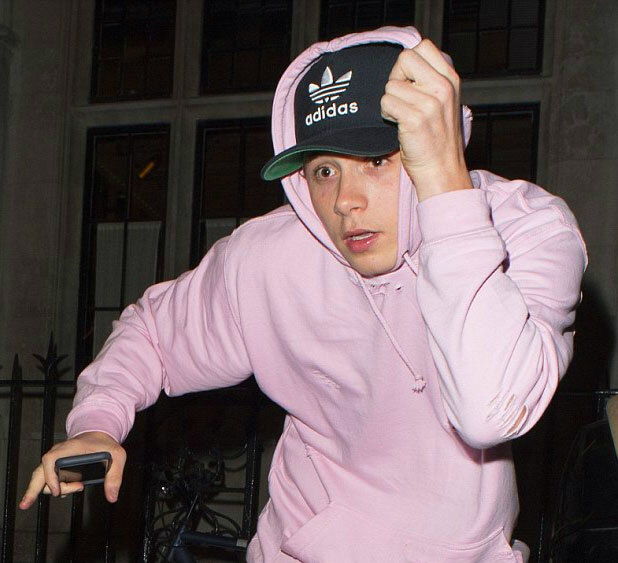 He was wearing his trademark Adidas cap, of course, and a rather fetching pale pink hoodie - clearly Brooks was embracing his feminine side. When Brooklyn noticed the press, he quickly pulled up his hood, but there was no mistaking the trendsetting Beckham boy and his ripped jeans. Chloe Moretz was not so shy about being seen though and decided to walk out the front door instead, wearing a very cool £3,000 St. Laurent leather biker's jacket. One of his latest Intstagram photos shows Brooklyn texting on a phone whilst wearing his Adidas cap. Good work multitasking there Brooklyn. And that's had almost 400,000 likes already.